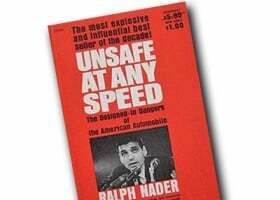 On Nov. 30, 1965, consumer advocate Ralph Nader published Unsafe at Any Speed, a landmark book that helped usher in the modern auto safety movement in America. The book prompted Congress in 1966 to create the agency that became NHTSA in 1970. No longer would the auto industry be self-regulating when it came to safety. Though the 277-page book is often linked in its entirety to the Chevrolet Corvair, only one of its eight chapters deals with the rear-engined GM compact, which was built from 1959 to 1969. The first-generation Corvair had a rear suspension design that could cause accidents, sometimes fatal, in certain conditions if the tires were not properly inflated. GM redesigned the car in 1965 and fixed the problem. Still, the publication of Unsafe at Any Speed prompted GM to hire private detectives to smear Nader. GM President James M. Roche, speaking at a U.S. Senate hearing on March 22, 1966, eventually apologized for the probe. "As president of General Motors, I hold myself fully responsible for any action authorized or initiated by any officer of the corporation which may have had any bearing on the incidents related to our investigation of Mr. Nader … While there can be no disagreement over General Motors’ legal right to ascertain necessary facts preparatory to litigation … I am not here to excuse, condone, or justify in any way our investigating Mr. Nader," Roche said before the panel. "To the extent that General Motors bears responsibility, I want to apologize here and now to the members of this subcommittee and Mr. Nader. I sincerely hope that these apologies will be accepted. Certainly I bear Nader no ill will." The book and hearing vaulted auto safety into the public spotlight, leading to a series of landmark laws that have prevented millions of motor vehicle-related deaths and injuries. In November 1966, Nader sued GM for harassment, invasion of privacy and attempted intimidation. GM settled with Nader in 1970 and agreed to pay him $425,000, which he used to found several public interest organizations. 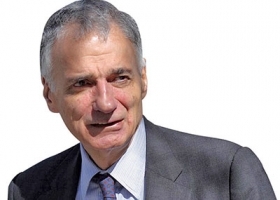 On the 50th anniversary of the publication of his landmark book, Nader says the auto industry should put the brakes on automated driving. Nader, speaking with Automotive News from his office in Washington, said he's not against much of the technology in today's vehicles, just the way some of it is being used. Last week, the National Highway Traffic Safety Administration estimated that 10 percent of 2014's traffic fatalities were caused by distracted driving. Nader: Concerned how some technology in today's cars and light trucks is being used. Over time, NHTSA was empowered to set minimum, uniform safety performance and eventually fuel efficiency standards for all motor vehicles, and to require automakers to notify owners and recall cars containing safety-related defects. The other chapters in Nader book dealt with dangerous surfaces in interiors that caused injuries in accidents, lack of seat belts, inconsistent automatic transmission shift quadrants, windshield glass and how design often took precedence over safety. The final chapter, "The Coming Struggle For Safety," called for the government to force automakers to build safer cars. After the formation of NHTSA's predecessor came the first legislation requiring laminated safety glass, dual circuit braking systems, standard seat belts, stronger door latches, additional lighting and other safety improvements. Fatalities per millions of miles driven began to fall, going from 5.30 in 1965 to 1.11 in 2013. Traffic deaths in the U.S. peaked in 1972 at 54,589 and were 32,675 in 2014, NHTSA data show. Clarence Ditlow, executive director for the Center for Auto Safety, founded by Nader and Consumers Union in 1970, calls Nader's book and his activism a seminal event in the history of car and light-truck safety. "The book played a major role in the passing of the 1966 act. The lasting impact is that the automakers came under federal regulators," Ditlow said. "When Congress held its hearings, Nader played a significant role in that, pointing out that the voluntary SAE [Society of Automotive Engineers] standards were a failure." In 2011, Time magazine placed Unsafe at Any Speed at No. 21 on its list of 100 All-Time Nonfiction books. Call Nader -- the Corvair's back!